Sox Fans, All is not Yet Lost! I know things seem bleak right now for the White Sox. Injuries -MVP front-runner Carlos Quentin, All-Star Joe Crede and #4 starter Jose Contreras are all lost for the year- and losing three of the last four at home have whittled the division lead down to one skinny game and a half. However, there is still plenty of reason for optimism. 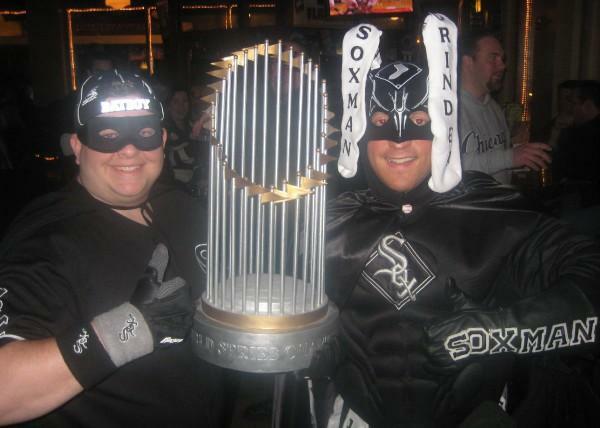 The Southside’s #1 superfan, the Soxman, gave an inspirational speech on my site this morning addressing Sox Nation. I’m going to complement his emotional plea by expanding on some logistical points that he brought up. -Only one series against a contending team remains. That would be the HUGE series in Minnesota the 23rd-25th. Should the Sox maintain their current lead on the Twinkies before that series, the pressure will be on Minnesota, not Chicago. With at least that margin, the Sox would only need to win one game of three to retain first place. The Twins will have to sweep the series or remain in second place. -The Twins have issues of their own. Minnesota’s bullpen has been utterly useless down the stretch and blew another one today. Plus the Metrodome residents have just as much trouble winning on the road and about the same number of road games as the Sox. They also have 7 games remaining versus the AL East. Their record versus the division is an awful 9-19. -Tevye sang in “Fiddler on the Roof” about how everything comes down to “Tradition! TRADITION!” Winning the Central depends on “execution. EXECUTION!” In 2005, the Sox used “Ozzie Ball,” a.k.a. “Grinder Ball” to win by taking advantage of the other team’s mistakes. This style is a derivative of the popular “small ball” and is built around the principles stressed by the famous “Oriole Way,” which made the Orioles a dynasty in the 60s and 70s. Yes, Baltimore was once actually a powerhouse- I’m not making that up. -The Sox have been plagued by a lack of ability to execute and manufacture runs, best illustrated in the 15 inning win over the Angels on Saturday night. They blew golden opportunities to win the game in the 9th, 10th, 12th and 14th innings. However, in the 6th inning last night we saw September call-up Jerry Owens execute a perfect suicide squeeze as less-than-fleet-of-foot catcher A.J. Pierzynski sprinted down the third base line. That sixth and final run was the crucial tipping point for a one run victory. If they keep doing little things like that…we’ll see them in October. -Every time the White Sox have lost first place this season, they regained it within a couple days or so. There have been numerous ties and lead changes in the AL Central, but the 2008 Sox have constantly shown: when they are down, it’s never for long.